Reading United has announced the return of three key offensive prospects from last season’s squad. Khori Bennett, Aaron Molloy and Pierre Reedy return to form a solid veteran core of attacking talent that new Reading Head Coach Alan McCann will lean on throughout what is shaping up to be another competitive Premier Development League season. Khori Bennett will be back with Reading for his third summer with the club. Bennett, who has just completed his junior season at Northeastern University, was a factor in United’s potent attack. In 2017, the Jamaican forward tallied four goals in six regular season. In his two seasons with Reading United, Bennett has played in 19 matches and scored six goals. The Reading United veteran also holds the distinction of scoring the club’s first goal of the PDL campaign in each of the past two seasons. Molloy, the PDL’s Young Player of the Year in 2017, will look to continue to build on his first full season with Reading United. Molloy, a rising junior at Penn State University, scored eight goals and recorded one assist to help United reach the playoffs for the second consecutive season. The young Irish midfielder also led the team in minutes, playing 1011 minutes over 12 league matches in 2017. He also featured in Reading’s first round U.S. Open Cup victory over Clarkstown SC. The Dublin, Ireland native has played in 19 matches and found the back of the net ten times in his two seasons with Reading United. Local product Pierre Reedy also returns to Reading for his third season with the club. Reedy, a college teammate of Molloy at Penn State, is a Kutztown, Pennsylvania native and led his Kutztown Area High School team to the PIAA District 3 Championship in 2014 when he scored an incredible 43 goals for the Cougars. The Reading United forward was named to the Big Ten All-Freshman team in 2016 but an injury forced him to sit out nearly all of his sophomore season at Happy Valley. Reedy has played in six matches during his Reading United career, registering one goal and one assist. 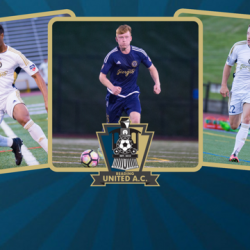 The veteran trio will look to get Reading United off to a fast start when the club begins play in 2018 with a U.S. Open Cup first round match against Maryland amateur powerhouse Christos FC on Wednesday, May 9th in a match hosted by Alvernia University at their all-new Alvernia University Stadium in Reading. United begin their 2018 PDL home schedule on Saturday, May 26 when they host FA Euro at Wilson High School’s Gurski Stadium.